Fly Fishing Luggage . . . Don't leave home without it. 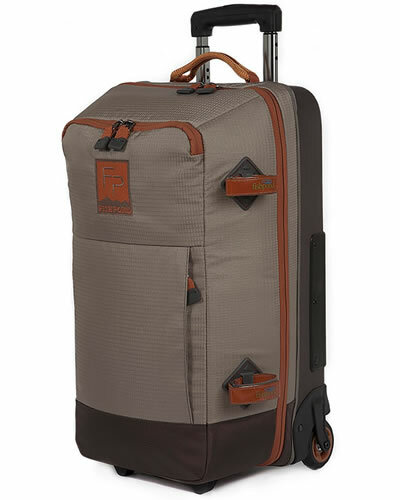 FishPond Rollig Fly Fishing Luggage. Ideal for fly fishing trips to Montana - by plane or car. 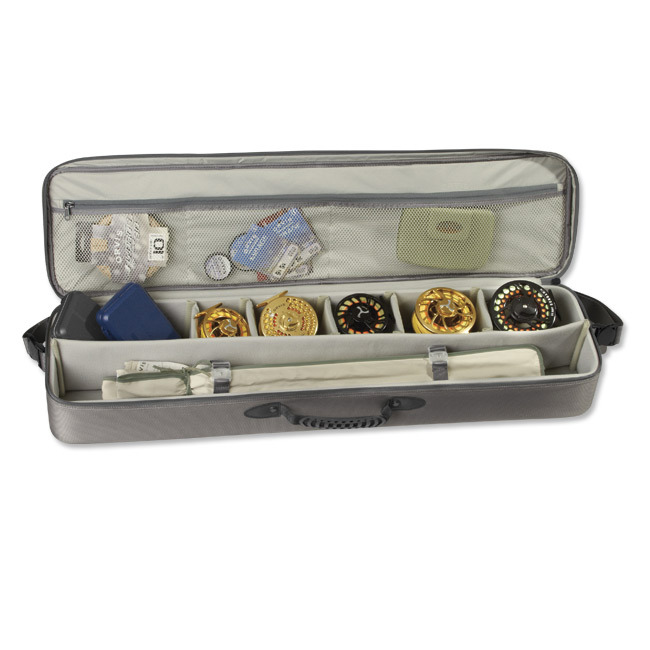 View more fly fishing luggage at Amazon. Any angler that plans a long distance fly fishing trip, particularly if the angler will be flying or be traveling along the back roads, having luggage that is designed for the odd shapes of fly fishing gear is mandatory. Failure to have good luggage is a recipe for unpleasant things to happen to an anglers gear. This is especially true if the angler will travel by plane—it is well known that the airlines secretly detest fly rods and will break them given the first opportunity. Because of this, anyone who plans on doing lots of traveling with their fly fishing gear should get some good luggage to haul it all around. Moreover, the luggage has a second purpose too—to keep gear organized. What Kind of Luggage Is Needed? Many anglers try to avoid buying any extra case or luggage to carry their gear to save a few dollars. While doing so isn’t criminal (yet), anglers will find many benefits to swapping their generic suitcase for a specialized piece or two of luggage designed for the unique uses and odd shapes of fly fishing gear. Orvis Safe Passage Rod & Reel Case. View all Orvis Safe Passage tackle bags and luggage at Amazon. By far the most important “luggage” requirement is a rod tube to protect the angler’s fly rod. Traveling around with a fly rod, whether by plane, car, boat or horse, that isn’t safely tucked away in a rod tube, is an invitation to a broken rod. Fortunately, virtually all fly rods bought today come with their own protective rod tube. Unfortunately, these rod tubes aren’t especially well suited for travel. Rod tubes that come standard with fly rods, while they provide excellent protection for the fly rod, lack the ability to store “other things” with it. Moreover, rod tubes aren’t ideal for travel by plane. Rod tubes lack a handle for easy carrying and, often, will be eyed suspiciously by TSA and airline personnel alike. Because of this, rod tubes are basically best used by anglers who will be traveling no further then their local waters. Anyone who plans on longer distance traveling, or will be traveling by plane, should consider investing in specialized piece of luggage designed to not just protect the fly rod but is also roomy enough to carry the fly reel and which also has a handle or shoulder sling for easy carrying. 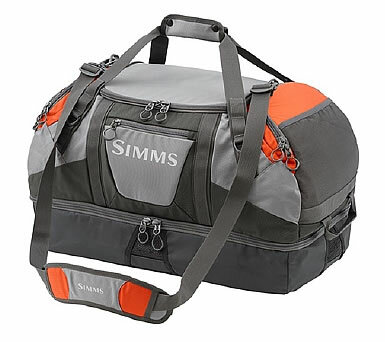 Among the many different types of luggage available to carry a fly rod and fly reel, I personally find the various luggage made by Orvis and Simms the nicest. In particular, their safe passage luggage is excellent for carrying around the fly rod, reel and related fishing accessories in a safe and well-organized manner. Of course, other brands and styles of luggage also exists. Cabela’s has a large selection of luggage pieces designed to carry the fly rod and fly reel. And FishWest has a great selection of fly fishing luggage that works (and looks) nearly identical to a standard carry-on suitcase. Waders are great, aren’t they? They keep the angler dry and relatively warm, despite standing hip-deep in a river fed by high altitude snowmelt. And the wading boots allow the angler to actually stand up in the river instead of slipping and taking an unplanned body surfing trip down the river. Yet, there’s one slight problem with waders and, especially, wading boots. They get wet. And muddy—often very muddy. While the mud poses no real problem to local anglers, who can just toss them in the back of their truck at the end of the day, anglers who arrived in Montana by plane and are now using a rental car lack this option since rental car companies do frown upon their cars returning to the lot a muddy, stinking mess. Moreover, hotels—even enlightened ones in Montana—often aren’t enamored with anglers dragging their wet and muddy gear into their rooms, let alone washing down muddy wading boots in the hotel tub. So what is a traveling angler to do about their wet and muddy waders and wading boots? Simple—wash everything down streamside and then carry all the wet (but now no longer muddy) gear in a special sized and designed bag that is vented along its sides, thus allowing everything to dry out overnight. These bags also pull double duty by carrying the waders and wading boots while traveling, whether by car on the plane. These bags, which are almost always designed of various types of quick-drying materials, are extremely handy for traveling anglers and offer a solution to “what to do” with the waders and boots while traveling. Moreover, the cost for this type of bag is minimal—generally ranging from $30 to $70, depending on what style is chosen. Finally, another bonus of using a wader bag is that most bags come with a changing mat, making it simple to cleanly change out of waders and back into street clothes at the end of the day. Overall, a wader bag might be a luxury deferred by local anglers with dirty pickup trucks. But for anglers traveling, who are using rental cars, or staying at hotels, wader bags solve many organization and cleanliness problems simply and cheaply. Wader bags aren’t widely available, for whatever reason. Orvis on occasion carries some, as does Cabela’s. However, the best place I’ve found that carries a decent selection of wader bags is at Amazon, which generally has about a half-dozen different styles offered for sale.